Mathchem. Python package for matemathical chemistry calculations. Mathchem is a free open source Python package for calculating topological indices and other invariants of molecular graphs. Together with Sage or SciPy it can be used in QSAR/QSPR research. The package allows to read various molecular file formats, retreive data from online NCI database using search query, import graph structure from Sage and NetworkX graphs structures or parse a g6 string. Mathchem can be installed as a normal Python module or(and) as a Sage module. Sage is a free open-source mathematics software system licensed under the GPL. It combines the power of many existing open-source packages into a common Python-based interface. Its mission is to create a viable free open source alternative to Magma, Maple, Mathematica and Matlab. Sage uses Python virtual enviroment which use an isolated instance of Python interpreter. This means that all the packages intalled for system Python are not available in Sage. Thus to use mathchem both in system Python and Sage the package must be installed twice as described below. Mathchem was designed as a lightweight self-contained library. However the package requires that Numpy was installed before. Cirtainly it requires Python interpreter which may be already pre-installed in OS. There are two ways to install mathchem as a Python modeule. Since mathchem is included to Python Package Index, one can use the pip tool. The main advantage of this method is that the package can be easily updated with one line in terminal. First pip checks for dependencies and install them first. Mathchem depends on Numpy the part of SciPy. Another way is to use the module built-in setup.py installer. Download python module archive file from the homepage. All these instructions are given for a UNIX-like system. For Windows the process of installation is similar. Since mathchem is a normal Python module, the official Python manual how to install modules can be applied. Download spkg file the homepage. After that you can use mathchem in your sage programs. In this section we give several examples of how mathchem can be used in practice. In the example above we put the Mol class instance into variable m. Here we invoke the class constructor with a graph6 string GhCH?_ which represents a carbon skeleton of 3,4 - Dimethylhexane (C8H18) molecule. Another way to input structure data is to read a file containig molecular data stucture records. 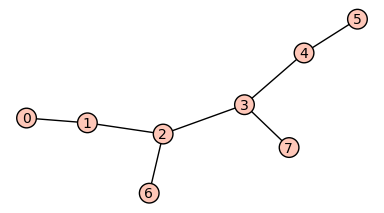 Here we read a sdf file and allow hydrogens to appear as vertices in molecular graphs by setting the second argument of read_from_sdf method to True. The default value of the argument is False. After executing this code the variable mols will contain a list of all records from the file compounds.sdf. NetworkX is a Python language software package for the creation, manipulation, and study of the structure, dynamics, and functions of complex networks. For further calculations outside of mathchem package the Mol class instance can be easily converted to Network X graph. Sage is a powerfull free open-source mathematics software system which contains more then 100 mathematical packages. We can use the power of Sage together with mathchem. In the following example we convert mathchem molecular graph to Sage Graph, visualize it and check for hamiltonicity. The actual number of retreived records is 993. Suppose we are going to have deal with distance matrix and we must be sure that we have only connected graphs for tests. The following code will filter our set. Here we use Python filter function. Now bj list contains calculated Balaban J index for each compound in mol_c.